Sixteenth in a series of posts celebrating 200 years of Jane Austen’s Mansfield Park. For more details, open Your Invitation to Mansfield Park. I can’t wait to see “A Dangerous Intimacy: Behind the Scenes at Mansfield Park,” a play written by Diana Birchall and Syrie James for the JASNA AGM in Montreal. The play stars many people familiar to JASNA members, including several contributors to “An Invitation to Mansfield Park”: Juliet McMaster, Natasha Duquette, Karen Doornebos, and Diana and Syrie themselves. Diana is a story analyst at Warner Bros., reading novels to see if they would make movies. She is also the author of a scholarly biography of her grandmother, the first Asian American novelist, Onoto Watanna (University of Illinois Press), and several “Austenesque” novels, including Mrs. Darcy’s Dilemma and Mrs. Elton in America (Sourcebooks). A couple of months ago, at the used book sale put on by Women for Music at the Halifax Forum, I picked up a collection called New Women: Short Stories by Canadian Women, 1900-1920, edited by Sandra Campbell and Lorraine McMullen, and was delighted to discover a story by Onoto Watanna (also known as Winnifred Eaton Reeve) alongside stories by L.M. Montgomery, Nellie McClung, and several others. I enjoyed reading the story of “Miss Lily and Miss Chrysanthemum,” two sisters reunited in Chicago after being brought up separately, Lily/Yuri in America by her father, and Chrysanthemum/Kiku in Japan by her mother. And after reading about the author’s friendship with Edith Wharton, one of my favourite writers, and her years of living in Alberta, one of my favourite places, I’m now even more keen to read Diana’s biography of her grandmother. Diana has also written and produced several Jane Austen-related comedy plays, and she blogs at www.lightbrightandsparkling.blogspot.com. “My father is come!” Illustration by Hugh Thomson. For over forty years, longer than Jane Austen’s own lifespan, I have studied her works and her life: ardently, faithfully, and never getting to the bottom of her (so to speak). What have I learned? That there is ever more to learn; that deep acquaintance with one subject has its own deep rewards; and that in choosing to devote my life’s study to Jane Austen, I have chosen well. Along the way, although not an academic, I have developed my own method of study. Probably many others have pursued the same path and it’s got a name, I just don’t know it. Rather than close reading, you might call it close writing. For me, it began in 1985 when I won a contest in Persuasions, imitating Jane Austen’s style. Obviously one can’t, but I had fun trying to “do” a bit of Miss Bates, and I was surprised to find that I had actually learned by doing this exercise … something about the elegant balance of her sentences. So I kept on, doing pastiche, sequels, continuations, whatever you like to call them. And with each one, I learned more. In writing about Mrs. Elton, I observed how deliberately Jane Austen framed her as a monster, while treating the erring Emma gently. Considering Lady Catherine, I became engrossed by how vastly different her aristocratic influences would have been, compared to those of the middle class characters – or to Austen’s own. Her very rotund, rolling speech announces her class. This year being the year of Mansfield Park I have (heaven help me) been spending my time with Mrs. Norris. One of the nastiest of Austen’s characters (and I do seem to be attracted to the monsters, for what subconscious reasons I don’t want to know), she is for me one of the hardest to understand. What has embittered her? Does she import Fanny on the principle of a monstrous midlevel manager who wants an intern to bully? One thing is clear, she feels she has been cheated in life, and she doesn’t mean to let anyone else be happy if she can help it. I hope I can finally understand her by October, as I am to portray her in the staged reading of the play I wrote with Syrie James, “A Dangerous Intimacy: Behind the Scenes at Mansfield Park,” at the JASNA AGM in Montreal. But I fear it is too late now: her psychology remains a closed book to me. It was while I was trawling around in the greenroom at Mansfield Park, a silent observer like Fanny, that I suddenly noticed the Scene-Painter, almost for the first time. He is the most minor of characters, mentioned in only two sentences, and yet such is Jane Austen’s skill that she paints him whole in just that space. He is a stranger and alien presence at Mansfield Park, a disruptive presence too, who in just a short time causes damage all out of proportion (almost like the Crawfords! ), ruining the floor, the sponges, and the servants. What a story in microcosm! And what an unusual character for Jane Austen to introduce. Socially, what is he? He belongs to no world she has ever shown us before. It is the world of Bohemia, which we may have imagined would not be something Jane Austen knew anything about. But the Scene-Painter is not gentry, nor a workman like the carpenter. He comes from London (“Entirely against his judgment, a scene-painter arrived from town, and was at work, much to the increase of the expenses, and, what was worse, of the eclat of their proceedings”) and imports attitudes and ideas that are indeed dangerous to servants in a country house. His very presence even introduces “éclat.” What were these attitudes? Who was this scene-painter, what was he? Would he have come from Covent Garden, center of artistic bohemian London; might Jane Austen have seen such louche folk, while on strolls near her brother’s house in Hans Place? As usual, I could not find a way to know and understand this Austenian bohemian through lit crit, but only through fiction. 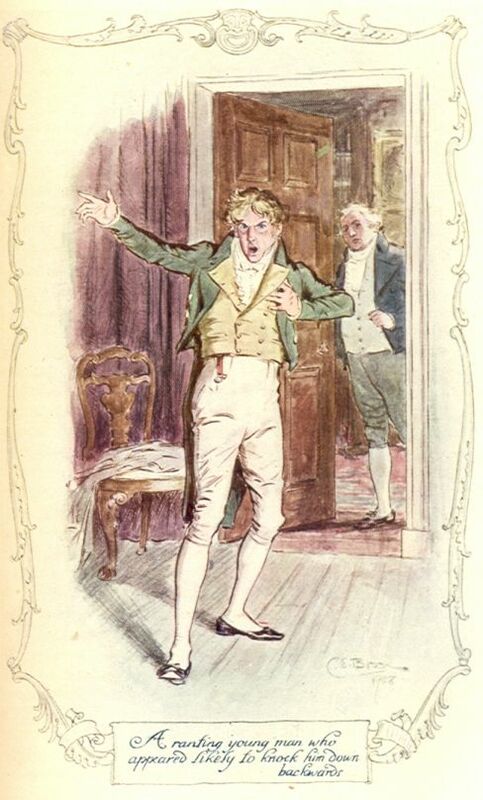 “A ranting young man who appeared likely to knock him down backwards.” Illustration by C.E. Brock. The scene-painter arrived, and Tom introduced him to the party, quite as if he were a gentleman. “My friend Robert Sharp,” he said, and Yates greeted him familiarly, though the others held back, and gave uncertain nods. He was a very handsome young man, wiry and active in make, with sparkling dark eyes and long hair worn in what Fanny thought of as the poetical fashion, as she had seen in engravings of the “Lyrical Ballads” poets. He did not look like a workman at all. Mr. Sharp made his bow in form, and did not appear to be at all embarrassed. Edmund, who had been watching with as much surprise and alarm as Fanny herself, quietly reminded his brother of their resolution to keep the costs of the play low. “But we don’t want the backdrops to look like Turner paintings, Tom,” protested Maria. Fanny was surprised by her cousin’s boldness at speaking to the new arrival so freely, and by her addressing him as a gentleman, not a servant. Meeting Edmund’s eyes, she saw he thought the same, but she supposed that Maria was merely following Tom’s lead. “You do, sir,” and Maria made a courtesy. “And I am to be the pert Amelia,” said Mary Crawford, with a smile. “Miss Julia was to take the part, but she declined,” put in Yates, with a meaning look at Julia, who tossed her head. “I was hoping there might be cherubs,” put in Mr. Rushworth, who had only been half listening. “I am to be very fine, you know, Sharp, in a blue dress, and pink satin cloak. I thought a background with flying cherubs, in similar colors, might flatter my clothing, if not myself. I know I am nothing to look at,” he finished with a deprecating laugh. Every thing was said to assure Lady Bertram that all standards of decency would be preserved. “You mean to put him in the yellow attic?” considered Mrs. Norris. “There are some boxes … only some old things of your mother’s that I have been storing, but I never consider myself, or my needs. Yes, I suppose it will do, that is, if you are determined to have him in this house,” she conceded ungraciously. The girls were young and pretty, and Edmund looked concerned. “Tom, I would like to speak to you for a moment,” he said abruptly. “Where did you meet?” asked Edmund, tight-lipped. “Why, you can’t think she would be susceptible to his charms!” Tom laughed immoderately at the idea. “Very well then.” And Edmund had done, hoping that he had at least planted some thoughts into Tom’s mind. Read “The Scene-Painter, Part Two” here. To read more about all the posts in this series, visit An Invitation to Mansfield Park. Coming soon: guest posts by Deborah Barnum, Laurel Ann Nattress, Lorrie Clark, and Elaine Bander. Subscribe by email or follow the blog so you don’t miss these fabulous contributions to the Mansfield Park party! Thank you, Elizabeth! I’m glad you’ve shared in a similar experience, in my book mixing academic work with fiction writing just makes both better, and is incredibly broadening. Now I’m dying to read “Mary Crawford’s Last Letter.” I see it was honored by Chawton House Library, but where can it be read? I, too, am dying to read “Mary Crawford’s Last Letter,” Elisabeth. Elisabeth! I’m so sorry about using the Z. That’s as bad as “Austin”! This was a charming story. You really do approximate Austen dialogue and tone quite nicely. I had one nit on aunt Norris. I wouldn’t say that “she doesn’t mean to let anyone else be happy if she can help it.” For one thing, she truly wants Maria and Julia to be happy. She just wants, somehow, the credit for producing their happiness. I think your likening her to a monster middle manager who imports an intern to bully is quite apt. I haven’t studied as long as you and you’ve probably already considered this, but I’ll just throw this out there. I wonder if aunt Norris is acting primarily out of envy. I think aunt Norris may well be nearly eaten up with envy. Living next door to this grand estate and her sister’s good fortune (and laziness) for her entire life. But, she’s hidden it well, even from herself. She doesn’t try to cut her sister or the estate down or devalue anything in any way. Instead, she worms her way in. She takes control. She may not have de jure control of Mansfield Park but she has close to de facto control (especially when Sir Bertram is away). She has all the blessings of possession of Mansfield Park, including the credit for marrying Maria well. To me, it’s a kind of psychological legerdemain, appropriating other people’s happiness to herself. Poor, dependent, nobody Fanny is what aunt Norris most fears being and, if she can just keep the girl in her place, she’ll prove she isn’t. Wish I could see the play! Maidrya, I couldn’t agree with you more. ENVY is what Mrs. Norris really is all about, and since you wrote what you just did about it, I’ve had a flash that Jane Austen even gave us a signal. Why is Mrs. N so obsessed with GREEN baize? Could the color be emblematic of her envy? She does act like somebody who thinks she’s been cheated in life and is always scrounging around, manipulating for what she can get. She is almost devoid of self-knowledge, and whitewashes her own behavior to herself, as we’ve seen some people like that do – they’re convinced everything THEY do is right. What a psychologist Jane Austen was! One thing, I’m not so sure she truly cares about Maria and Julia (or Tom) being happy. As with Lady Bertram, things are good for Mrs. Norris when her sister and her family are doing well, but does she really care about them for themselves? Would you scheme and work for the marriage of somebody you really loved, with a Mr. Rushworth? She knows and cares nothing of how her nieces and nephew really feel. She only cares about herself. Green baize — perfect! Thanks, Diana and Maidrya. Excellent point, too, about Mrs. Norris wanting to avoid being a poor nobody like Fanny. And, there seems to be some caring on aunt Norris’ part – after all, she joins Maria in her social banishment. Could be sheer stubbornness – I’m sure it’s something twisted – but there is some kind of loyalty. “There is some kind of loyalty” – very good point, Maidrya. I think, of all her family, Mrs. Norris does care for Maria the most, perhaps sees her as her daughter. To go to live with her, voluntarily, as she did, shows that she still supports her. That her “attachment seemed to augment with the demerits of her niece,” is interesting. So is this: “It ended in Mrs. Norris’s resolving to quit Mansfield and devote herself to her unfortunate Maria, and in an establishment being formed for them in another country.’ You notice, it is Mrs. Norris taking action, Mrs. Norris “resolving” what to do. It’s not Sir Thomas packing her and Maria off to a remote country, as you might suppose; it is Mrs. Norris! Also, Jane Austen tells us this: “on one side no affection, on the other no judgment.” That means, yes, you are right, Mrs. Norris does indeed feel affection for somebody. The unfortunate Maria. I enjoyed this post–for all the reasons already mentioned! I loved the extra story–very well done. Detected a bit of Georgette Heyer in Tom’s mention of the ‘ton’, etc. but then he was a bit of a rattle, wasn’t he…very fun. The ‘artist in residence’ has fueled many stories and intrigues with the young ladies in the house, by other writers of a later date…(aka ‘The Fascinating Undesirable’); I had not noticed him in MP. As you said, what a brilliant work Austen made of him in two short sentences! She captured, not only his influence while there, but the apparent notoriety the Bohemian magnetism was already creating in her day. Her use of the word éclat…as you pointed out…brilliant! What, really, escaped Austen’s attention? Genusrosa, after many years study of the matter, I can only echo you in saying that nothing escaped Austen’s attention! Clearly one could write a whole book about a “fascinating undesirable.” I strangely haven’t read any Georgette Heyer, but am thinking I should start! As a friend of mine pointed out, Mrs. Norris is also jealous of Mrs. Price. Mrs. Norris never had any children when she could afford them. Mrs. Price kept having children she couldn’t afford. I suspect that’s also at the root of her treatment of Fannie. The first chapter ( I’m paraphrasing ) says that without any easy means of knowing Mrs. Price’s activities and circumstances, Mrs. Norris periodically would be able to announce that her sister had had another child. That required considerable effort. Green baize is the traditional fabric that padded the door between the main house and the servants’ quarters. So Mrs. Norris May have been planning to upgrade her cottage a bit with it. Glad you got inspired, Arnie! That’s fun for me too. We’ll be sharing the second half of this story in due course, and I look forward to seeing you get to work on that as well! The difference in situations must have galled Mrs. Norris. First, she felt forced to settle for a loveless marriage while her indolent sister made a brilliant match. Then both her sisters produced several children each that they could not, or would not, care for properly. Mrs. Price gets our sympathy because she was too poor to keep having all those children. However, later we see that she is a lot like Lady Bertram and is also too lazy and inefficient to manage her home well. Mrs. Norris may have thought she would have done a better job as a mother than they did. She may have been right. She was a born manager. Sharon, Mrs. Norris certainly was a born manager! It’s interesting to think how she might have had more outlet for her talents in today’s world. On the other hand, even though she had such a spirit of activity, it can’t be said that she was a GOOD manager. Most of her projects didn’t turn out well at all! You’re right, most of aunt Norris’ projects don’t turn out well. The only way she is a good manager is in her handling of money. On a small income with her husband she still manages to save. On an even smaller income after his demise, she tightens her belt even more. The interesting thing to me was that Austen gives mixed treatment to this quality of aunt Norris’. She states that aunt Norris would have been more respectable than Fanny’s mother if she’d been in similar straightened financial circumstances, so that’s to her credit. But, she also seems to judge aunt Norris negatively and I can’t think now of where she says this or how, but I do recall that it’s fairly explicit. Aunt Norris’ parsimony says something questionable about her – Austen questions whether this aim of aunt Norris’ – to be so very thrifty – is really such a good one. The more I think about how this is emphasized, the more I think this must be very important to Austen’s conception of the character. I can’t think it through right now, but one thought is, Aunt Norris just does not give, she hoards. She has no sense of life as a gift. Further, there are some hints that she manages so efficiently by taking from others. At the visit to Sotherton, for example, she walks off with partridge egg(s), I believe and some other goodies, I forget if it was jellies or jams or what. Aunt Norris’ version of this is that the cook, or whoever, insisted that she have them, but I think we all know that’s not quite how it went down. For that matter, she “steals” the green baize. Not exactly stealing, but she does manage to make off with it without anyone ever noticing, as I think someone else on this thread has noted. I was one of those readers who didn’t really get Mansfield Park, thought of it as a much less charming Pride and Prejudice or Emma. As I begin to see it’s just a different enterprise altogether, I much better appreciate the scope of Austen’s ambition and success. Ah, praise from the master is praise indeed! Thank you Syrie! I think Mrs. Norris’ love for Maria was essentially projection onto the Princess of Mansfield her own frustrated desire to be super-rich and thus successful. That’s why she was so proud of making that brilliant match for her, and talks about Mr. Rushworth’s fine fortune giving them the right to be living in one of the best houses in Brighton. The super-rich have rights; the hoi polloi don’t. 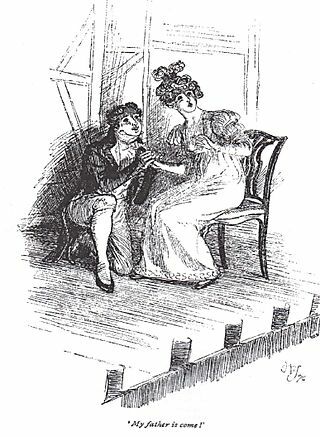 She had no idea of, nor interest in, what was going on in the mind and heart of her beloved Maria, never noticed the period when Maria showed her cold contempt for Rushworth (though Sir Thomas saw it) nor the flirting with Henry, nor Maria’s heartbreak when he decamped after the aborted theatricals. To have no interest in what one’s beloved one is thinking and feeling doesn’t seem like love to me–rather like Mrs. Ferrars’ fondness for Edward, which was pretty much summed up in his making a brilliant splash in politics and society and marrying a woman of large fortune or high social position or both. She is into Power. When he refused she “killed” him, and he stayed dead for several weeks, until she was flattered into resurrecting him. Of course in that outcome Mrs. Norris is different. Mrs. Ferrars wasn’t as devastated because she still had her wealth and quite a bit of her power. Also, she couldn’t kid herself that Edward’s decision was anything but his decision, whereas Mrs. Norris has been living lies for so long, she could determine that none of the catastrophe was Maria’s fault, but Fanny’s. I think it is because her whole worldview centers in wealth as the top value, and everything and everyone else falling into place below that and staying there where there they belong. So when Maria’s marriage crashed and her wealth disappeared from sight, it was not only Mrs. N’s projection but her whole worldview that crumbled. She was hit by anomie so hard she couldn’t speak, manage, etc. But thanks to habitual self-deceit she managed to pull some of the pieces together. Keeping them together required Maria’s presence, and (I suspect) her ability to keep telling Maria that none of it was her fault, so she could keep believing it herself. I think Maria’s physical presence was a consolation prize for her own loss. The First Lady in Pearl Buck’s East Wind: West Wind undergoes a devastating crash of the same sort as Mrs Norris when her cherished son and heir, the focus of her life, makes a love match with a Western woman and refuses to marry his betrothed and produce a legitimate grandson–it makes for a fascinating comparison. Thank you for a brilliant analysis, Gracia Fay, it helped me understand Mrs. Norris’s thinking a little bit more. I see what you mean, she only valued wealth, so that was she couldn’t even perceive anything else about the Rushworth match. Also, it FINALLY explains to me something I never, ever really understood before: her motive for wanting to keep Fanny down. Why did she import her to MP only to keep crushing her? Because Fanny was poor and therefore worthless, and also she stood in for her poor and worthless mother, whom Mrs. Norris wanted to see get her comeuppance, for marrying without attention to money. I love your saying it was Mrs. Norris’s whole worldview that crumbled, and her need to keep telling Maria it wasn’t her fault. Good stuff! What a great story beginning. The scene painter is another example of how Jane Austen wastes nothing. In just a few sentences she gives us an entire backstory about the day to day effects of the play. That little bit suggests how the rot is setting into the gentry class and mirrors the intrusion of the Crawfords. I have always liked the word “ton” to describe the Regency “in” crowd. A quick search (www.mollands.net) suggests that Jane Austen used it once in the novels. In Mansfield Park Edmund describes the duties of a clergyman. “A clergyman cannot be high in state or fashion. He must not head mobs, or set the ton in dress.” (MP ch. 9). CCassidy, Jane Austen’s wasting nothing, her economy, her wheels-within-wheels intentions, it’s all amazing. I only realized that the scene painter was mirroring the damage the Crawfords did, while writing this story. Proving my point, you can learn through writing! “Ton” may be a sort of Georgette Heyer word but it certainly was in effect in Jane Austen’s day, as you point out. Thanks for the comment. How fascinating! I really think that emulating Austen’s model of writing, especially her graceful economy with words, is an excellent way to learn more about her stories. I had never thought much about the scene painter before, but he wreaks a good deal of havoc in the house — and how interesting to bring him in when everyone protested so strongly against the idea of bringing in outsiders to act in the play. Also, the corruption of the housemaids is a very serious strike against Mrs. Norris’s management of the house in Sir Thomas’s stead — she should have been much more vigilant on behalf of the servants. This was a fun, charming story — and now Mansfield Park and Vanity Fair will be forever linked in my mind! Well done.